Tantra Yoga DK offers classes (both groups and one-on-one), workshops, lectures, retreats and more based on Traditional Tantra Yoga (also called Kaula). Events can focus on the practical aspects of Tantra Yoga and meditation, they can be lectures about the philosophy behind Traditional Tantra, Tantra Yoga and meditation, or they can be a mix of these. Events can also include ayurvedic walking massage, where the participants will learn to give each other massage with their feet, or they can include basic sanskrit or chanting or can be put together according to your wishes. Contact Mikael Kjaersgaard Moeller for further information or for booking. Saturday 11. november 2017, 10:00-16:00. The workshop will be in Danish. 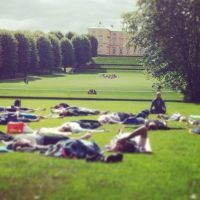 If you are interested in planning an event or further classes in Denmark, or in planning an event somewhere else in the world, you are very welcome to send an email to info@tantrayogadk.dk or contact me through my facebook page. At the moment there are no weekly classes. If you want to know about future events and classes, you can sign up for Tantra Yoga DK’s newsletter. You will not receive emails very often. You can sign up in the right side of the screen.